You write that you prayed fervently and at once you were calmed, receiving an inner assurance that you would be released from oppression; and then, indeed, it was so…. I won’t conceal the fact that, though once you prayed from the heart, it is hardly possible to pray that way constantly. Such prayer is given by God or is inspired by your Guardian Angel. It comes and goes. It does not follow, though, that we should give up the labor of prayer. Prayer of the heart comes when one makes an effort; to those who do not strive, it will not come. We see that the Holy Fathers made extraordinary efforts in prayer, and by their struggles they kindled the warm spirit of prayer. How they came to this prayerful state is illustrated in the writings they have left us. Everything they say about striving in prayer makes up the science of prayer, which is the science of sciences. The time will come when we will study this art [see the classic work The Art of Prayer (Faber & Faber)—webmaster]. But now, since it came up in our correspondence, I touch on it only in passing. Let me add: There is nothing more important than prayer; therefore, our greatest attention and most diligent attention must attend it. Grant us, O Lord, zeal for such an effort! The essence of morning prayer is to thank God for sleep, rest and regained strength and to pray that He will help us do everything to His glory. Express this to Him with your mind and with your whole heart. Along with such prayers in the morning and evening, present your greatest needs to the Lord, especially spiritual needs. Besides spiritual needs, present your worldly cares, saying to Him as would a child: “See, O Lord, my sickness and weakness! Help and heal!” All this and the like can be spoken before God in your own words, without the use of a prayer book. Try this and, if it works, you may leave the prayer book altogether; but if not, you must pray with the prayer book, otherwise you might end up with no prayer at all. Disastrous cooling down is caused by falling away from God’s will, through our own willful passion for anything ungodly. Willful passion runs counter to our conscience, which tries to enlighten and to keep us from ungodly desires. Willful passion kills the spirit and cuts off spiritual life. This you must fear most of all—as fire, as death itself. Willful passion is caused by a loss of the fear of God and by inattention to oneself. These, then, you must watch for in order to avoid such a terrible evil. As for those times when a cooling down comes involuntarily, due to sickness or weakness of body, one law applies: Endure, without changing your appointed rule, even if it is completely without savor. For those who endure patiently, cold feelings pass, and the usual warm and heartfelt fervor quickly returns. Zealous Christians have a certain technique that they apply to secure the continual remembrance of God more firmly. It is the constant repetition of a short prayer, ordinarily either, “Lord, have mercy,” or “Lord Jesus Christ, have mercy on me, a sinner.” If you haven’t heard this, then listen now. If you have never done this, begin now. Be encouraged! Take up prayer more readily and continue without interruptions—and you will soon achieve your desired goal. Soon a reverent attention to the One God will be established, and with it, inner peace. I say soon, not now, or in a day or two. Months may be required, sometimes, even years. Ask the Lord and He will help. Having contemplated their meaning and reacted deeply, make an effort to learn the prayers by heart, so when it is time for prayer, you will not have to fumble with books and lighting. If you learn prayers by heart, you will not be distracted by what your eyes see, and you will be able to hold your mind’s attention more steadily upon God. Particularly at the end of your prayer rule, spend additional time saying your own prayers. Ask for forgiveness for involuntary inattention during prayer and surrender yourself to God’s care for the whole day. At times, it is very fruitful to substitute a few psalms for the short prayer psalms you have reflected upon thoroughly and memorized. You can do this during free moments and throughout the day’s activities. Repeating memorized psalms is an ancient Christian custom that was developed and brought into the monastic rule in the fourth century by Saints Pachomius and Anthony [the Great]. After spending the entire day in such a prayerful attitude, take even more time in the evening to concentrate at prayer and increase your prostrations. Intensify your supplications to God and, having again dedicated to God’s care, bed down with a brief prayer on your lips and fall asleep with it, or with the repetition of a psalm. Having memorized all this, you will be totally armed for prayer. When a disturbing thought comes to mind, rush to the Lord with a brief prayer or some psalm, especially, “O God, be attentive unto helping me” (Psalm 69), and the disturbing cloud will immediately vanish. Stand and begin to do prostrations by saying, “Lord, have mercy,” or some other prayer expressing your needs, or by glorifying God or thanking Him. To avoid laziness, you must repeat a definite number of prayers, or set a specific length of time for prayer, or both. Such a prayer rule is imperative because we have a certain, strange quirk about us. When we are busy in the world, hours pass as minutes. But when we stand at prayer, a minute does not go by, and it seems as though we have prayed for hours. Time distortion brings no harm when we complete a full, established prayer rule from our prayer book. But when we pray with only prostrations and the brief prayer, such distortion can be a great temptation and can cause us to stop prayer, having only begun, leaving us with the delusion that our prayer was completed as prescribed. To avoid falling into this kind of deception, the good men of prayer invented the prayer rope. The prayer rope is used by those who plan to pray independently of the prayer book. It is used by saying, “Lord Jesus Christ, have mercy on me a sinner, ‘ and pulling one knot through your fingers. Reading this, don’t think that I am pushing you toward monasticism. I myself first learned of prayer with the prayer rope, not from a monk, but from a layman, for many lay people pray this way. And you too will profit by this. When prayers from the prayer book become tedious and uninspiring, you may use the prayer rope for a day or two, then return to your memorized prayers. Instantaneous prayer life is impossible. You must make a strong effort to control your thoughts, at least to some degree. Prayer does not come about as you expect—by just wishing for it, and, suddenly, there it is. This does not happen. You have the book of discourses by St. Macarius of Egypt. Kindly read the 19th discourse, concerning a Christian’s duty to force himself to do good. 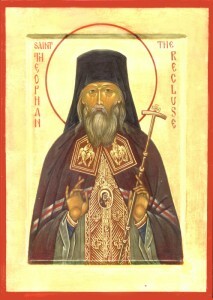 There it is written, “One must force oneself to pray, even if one has no spiritual prayer.” And, “In such a case, God, seeing that a man earnestly is striving, pushing himself against the will of his heart (that is, his thoughts), He grants him true prayer.” By true prayer, St. Macarius means the undistracted, collected, deep prayer that occurs when the mind stands unswervingly before God. As the mind begins to stand firmly before God, it discovers such sweetness, that it wishes to remain in true prayer forever, desiring nothing more. The most helpful idea is to attend church frequently. There, prayers come more readily because all is directed to that end, but this is not very practicable for you. So, labor at home to accustom yourself to pray attentively and try to remain in God’s presence the rest of the time, as much as possible. Do this also. Prepare yourself to stand properly before God—don’t just jump into prayer after gossiping and gadding about or doing house chores. Schedule the time and rouse the urge to pray precisely at that hour. Another opportunity may not come. Don’t forget to re-establish your sense of spiritual need. Bring your need for God to the front of your mind, then begin to draw your mind into your heart by organizing your thoughts into prayer and calling forth your desire to find their fulfillment in God. All of us have this little sin hanging about us. Though we make painstaking preparations for every other task (no matter how trivial), we do not prepare for prayer. We take up prayer with flighty thoughts, willy-nilly, and rush to get it over with, as if it were an incidental, though unavoidable, bother—and not the center of our life, as it should be. No, you must determine to deny yourself this little sin and under no circumstance allow yourself to come to prayer with your heart and mind unprepared, your thoughts and feelings scattered in a dozen directions. Such a careless attitude toward prayer is a crime, a serious one—a capital one. Consider prayer the central labor of your life and hold it in the center of your heart. Address it in its rightful role, not as a secondary function! There is a widely-accepted misconception among us that when one becomes involved in work at home or in business, immediately one steps out of the godly realm and away from God-pleasing activities. From this idea, it follows that once the desire to strive toward God germinates, and talk turns toward the spiritual life, then the idea inevitably surfaces: one must run from society, from the home—to the wilderness, to the forest. I see that these misconceptions have trapped you also. Cast them aside and grasp the concept that everything you do, in and outside your home, concerning social life, as a daughter, as a sister, as a Muscovite—is godly and God-pleasing. There is an appointed commandment for everything in our lives. How can the fulfillment of commandments be displeasing to God? Your misconceptions truly make them ungodly, because you fulfill your daily tasks with an attitude contrary to the one God intended you to have. You complete godly deeds in an ungodly manner. They are needlessly lost and tear your mind from God. Correct this and, from now on, approach daily matters with the knowledge that to fulfill them is a commandment. Administer them as administering God’s law. To avoid such self-deception, some do this: Set a definite length of time for prayer—a quarter of an hour, a half, or a whole hour (whatever is convenient), and regulate your vigil so that the clock striking on the half hour or the hour signals the end of prayers. Then when you begin prayers, do not concern yourself with the number of prayers read, but only lift your heart and mind to the Lord in prayer, and continue in a worthy manner for the time set aside. Others determine how many prayers can be done on the prayer rope in a given time and proceed in a calm and unhurried way to count them on the prayer rope. They stand with their minds before the Lord, or converse with Him in their own words, or recite some prayer, and this is how they reverently venerate His unending glory. I have already written to you about memorizing prayers, and reciting them from memory at prayer time without taking the prayer book in hand. How wonderful this is! Having begun to pray, recite a memorized prayer or psalm and ponder every word, not only in your mind, but in your heart. If your own prayer begins to grow from a word in the psalm or prayer, don’t cut it off, let it flow. Do not worry about reading this many or that many prayers, but stand at prayer for an appointed length of time, regulated either by the prayer rope or the clock. Haste in prayers is useless. Perhaps you may read only a single prayer or one psalm during the entire time. There was one person who was able to recite only the Lord’s Prayer during his regular prayer time; each word transformed itself into a whole prayer. Another person, having been told about this acceptable manner of praying, revealed that he had stood all through Matins reciting Psalm 50, “Have mercy on me, O God, according to Thy great mercy”—and ran out of time before he could finish. All is from God. To Him we must flee. And you write that you don’t pray. Smart-aleck! Have you joined the ranks of the infidels, or what? How is it possible that you don’t pray? Don’t just read the appointed prayers; speak in your own words and tell Him what is in your heart; ask for help! “See, Lord, what troubles me?…this and this… I can’t straighten myself out. Help, All-Merciful One!” Mention every little thing and plead for everything’s appropriate cure. This will be true prayer. You may always pray your own prayers, as long as there is no backsliding into sloth. You should pray in your own words—before you have recited formal prayers, after you have read them, and throughout your prayer rule (Letter 33). How fitting is the frequent prayer, “By whatever means, save me!” (Letter 39). Success does not come instantly; one must be patient; one must labor without rest… All will come in due time… That this is so is supported by the experience of all those people who are seeking and working out their salvation (Letter 43).